In the Northeast this time of year, a drive through the country to see the fall foliage and visit a pick-your-own apple orchard is almost obligatory. Yesterday I took a drive up to Vermont’s Champlain Valley with my parents, my brother Dave, and his girlfriend Julia. 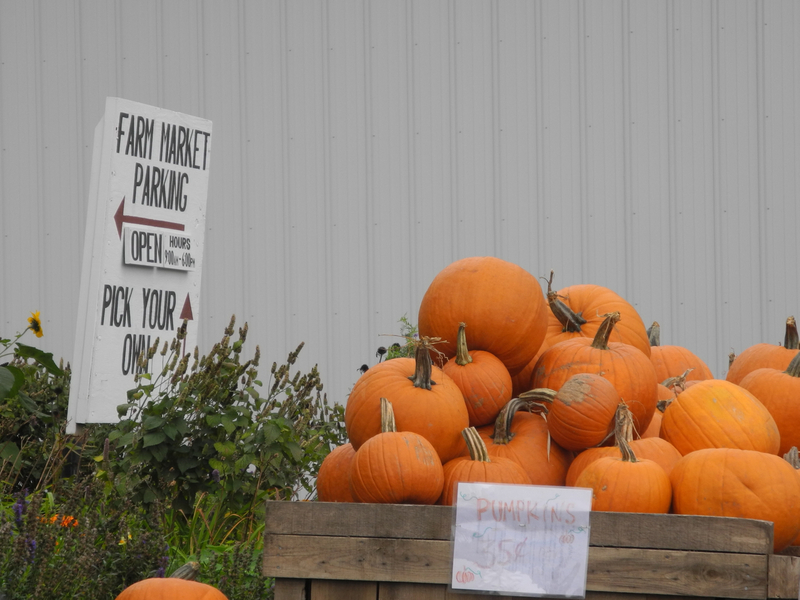 Sunday was Champlain Orchards‘ annual harvest festival. We picked a couple bushels of apples, and then stuffed ourselves with roast pork, apple sauce, baked beans, potato salad, coleslaw, corn bread, and cider, with apple pie for dessert. We’ve gone to the harvest festival at least four or five times over the years, and each time we’ve been back we’ve been amazed at all the improvements to the farm since our last visit. The first time we were there the pig roast was held in a little shed and there were just a handful of people there. Since then they’ve built a farm market and bakery, added new fruit varieties to the orchard, and have started brewing their own hard cider. These days the harvest festival draws quite a crowd. Before heading home we stopped in the farm market to pick up jugs of fresh cider and other provisions, and I was delighted to find prune plums for sale. I had been wanting to try making plum jam all summer, but I never did see them at the farmer’s market and I thought for sure I had missed my chance for this year. I brought home four pounds of them, and this morning I got right to work making a batch of jam. I added a little fresh grated ginger to this one, which gives it a nice, subtle spiciness. 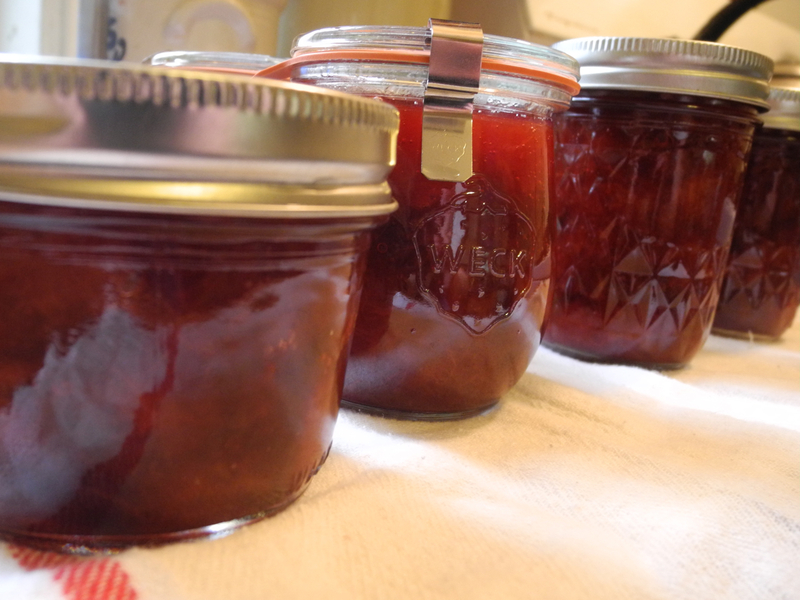 Prune plums are quite sweet and have plenty of natural pectin, so they are easy to make into jam and you really don’t need to add a whole lot of sugar. Combine all ingredients in a wide, heavy pot. Mix well and leave to macerate for a half hour or so while you get your jars ready. Put a small saucer or plate in the freezer. (You’ll want this later to test the jam’s set.) Once the plums have released a lot of their juices and the sugar has begun to dissolve, bring to a boil over medium-high heat. Cook, stirring almost constantly, until it begins to thicken. Once the jam starts to thicken begin testing it by taking your cold plate from the freezer and dropping a small puddle of jam onto it. Let it cool for a minute and then give it a little nudge with your finger. If it wrinkles up, it’s done. If not, test it again in another minute. I generally err on the side of too soft rather than too firm. It will thicken up as it cools. This batch took about 20 minutes to cook down, but this depends a lot on how juicy your fruit is and how wide your pan is. When it’s ready, remove from heat and give it a good stir. Ladle hot jam into clean, hot half-pint or quarter-pint jars leaving 1/4 inch headspace. Process in a water bath canner for 10 minutes. Posted on October 8, 2012 by kate. This entry was posted in Preserving and tagged apple picking, apples, canning, cider, fall, ginger, harvest, jam, plums, Vermont. Bookmark the permalink. Everyone around here is pretty much done with picking, but they still have bags for sale. 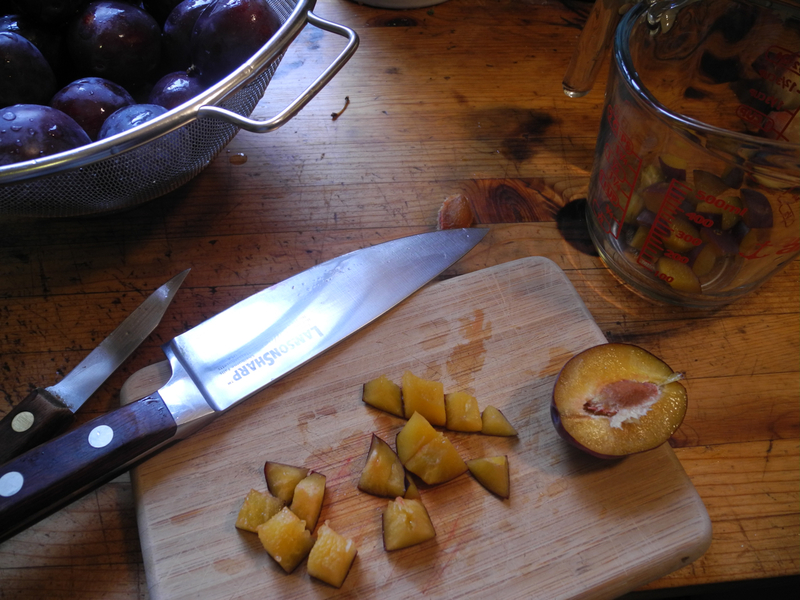 Really cool that you found the plums – not sure I saw any at all, locally. 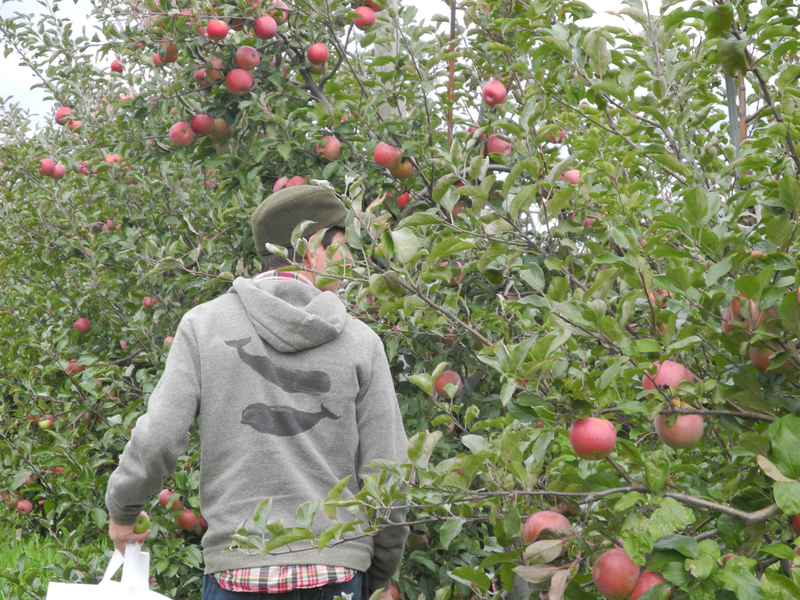 We went apple picking too this weekend – Lovely photos! 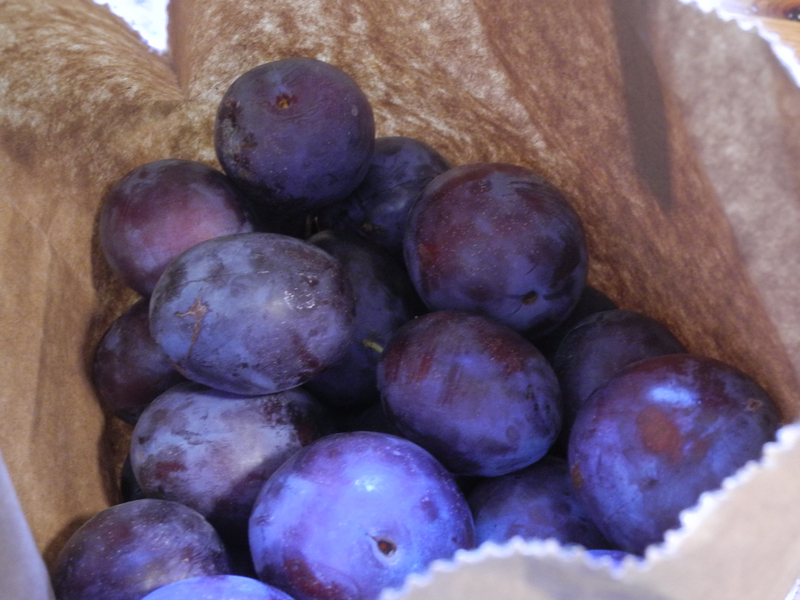 The colours in your photographs are amazing… I especially love the plums! What a delightful day out; that harvest feast sounds amazing. We have only managed a quick fly-by visit to a local apple orchard this year, but got to pick up loads of gorgeous apples and a bag of their famous apple-cinnamon donuts! Our own orchard produced nothing because of the drought we experienced this year (and we were not irrigating trees that we are still in the process of rescuing from years of benign neglect). I was hoping to make plum jam with ginger this year after seeing such a recipe in my favourite canning book, but never made it. I’m envious! Looks beautiful – enjoy your jam. It is so beautiful up there. I love this time of year and all the jams that can be made. Oh, that looks perfect! 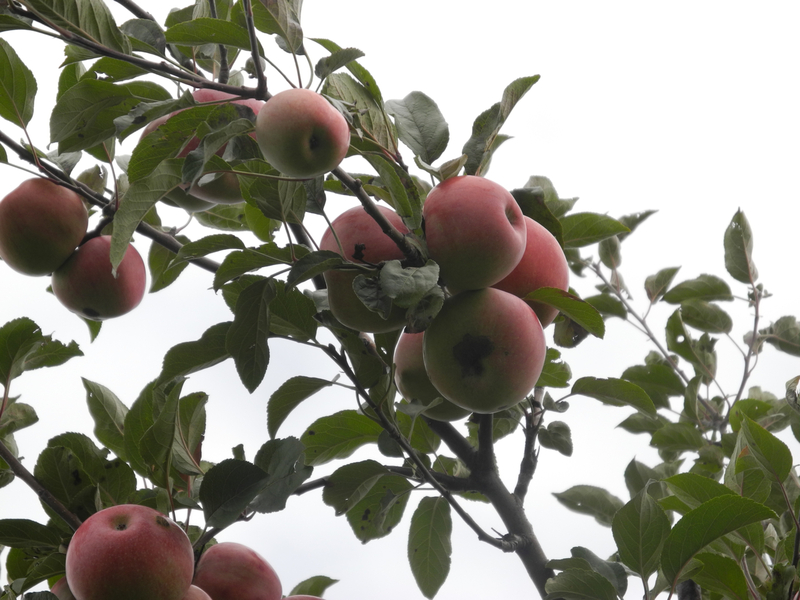 Apple-picking is high on my list this October. Nice! Jam is magical. Hope you enjoy a pot of this during a bleak day in February. It’s plum season here and I’m loving it! I like your idea of adding a bit of ginger to “spice” things up, a great idea! When I was a lowly cook instead of a chef the nun in charge of meals would have me make this wonderful German cake that you put prune plums on top of before baking. It was homie and comforting with a nice cup of tea or coffee. I never see prune plums anymore in the stores or farmers markets. They were the ones I remember seeing in the store as a kid. I see so many other types but no prune ones. What happened to all the prune plums?